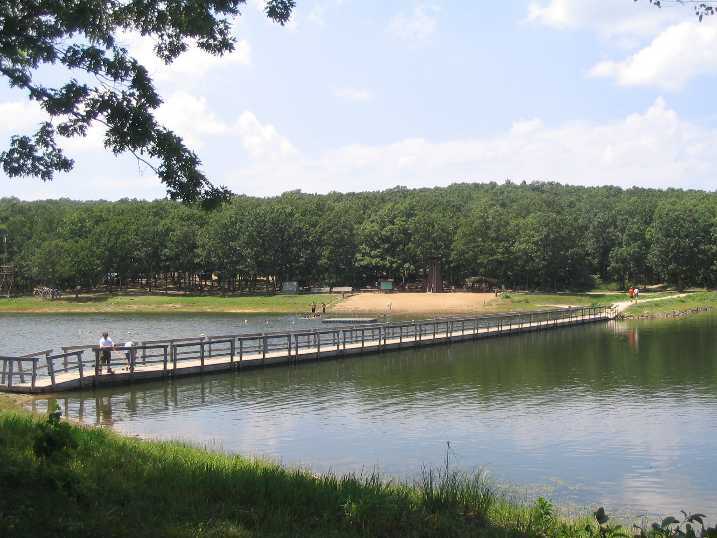 Troop 501 will attend summer camp July 19-25, 2015, at Camp Famous Eagle, at the S bar F Scout Ranch in Knob Lick, Missouri, south of Farmington, and north of Fredricktown. S bar F SCOUT RANCH is 5,200 acres of woods, streams, trails and fun. We will be camping on the Stark campsite, which we will share with another troop, on the banks (literally) of the beautiful 270 acre Nim’s Lake. There’s plenty to do at Scout camp. You’ll be able to swim twice a day, canoe, row, kayak, shoot a rifle, shoot archery, go to Hucks Cove, take an overnight canoe float and earn a few of the 24 different merit badges offered, as well as participate in the Order of the Arrow Call-out and Games Night. There are campfire programs for the entire camp on Sunday and Friday nights. If you feel bold, try the Mile Swim on Friday afternoon. Summer camp is one of the highlights of the Scouting year, and it can be particularly exciting for first year Boy Scouts, and a little intimidating, as well. Research has shown that those Scouts that attend summer camp their first year as a Boy Scout attain rank faster, and tend to remain interested in Scouting, longer. Scouts work on a variety of skills, in a variety of areas, often culminating in the awarding of merit badges. While Scouts prepare and cook their own meals on their own campsites at camps Theodore Gamble, Famous Eagle, and Sakima, at Swift Venturing Base and Camp Lewallen, meals are prepared by staff, and served in a dining hall. Summer camp is where Scouts will hone the skills they already have; develop new skills; work as a part of a team; find his limits – and then break through them; forge lasting friendships; and create life-long memories. 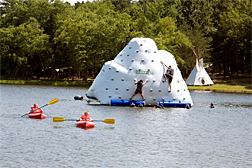 A special program is offered especially for our first year campers, called Voyageur. This first year program will offer the opportunity for Scouts to work on their early rank requirements. Many of the requirements for Tenderfoot, Second Class, and First Class lend themselves to the outdoor setting of summer camp. Scouts can practice knots and build fires and learn to use a hand axe. First year Scouts will have the opportunity to work on the Swimming merit badge, and those who are not ready to work on the Swimming merit badge will get to participate in instructional swimming class, daily. First year campers may also have the opportunity to work on a few other merit badges, such as Leatherwork, Wood Carving, Mammal Study, or others. One of this biggest advantages of the Voyageur program is not the rank advancement opportunities. It is that new Scouts will be with their buddies, and with other first year Scouts. They learn basic outdoor skills with others who are at their same level. This will help them adjust to camp life and combat homesickness. The main goal, after all, is for these Scouts to have an exciting and memorable experience at summer camp so they want to stick with the Boy Scout program. Every Scout and leader that comes to camp will want to swim, and there will be at least two times a day that you will be able to swim. The first is at your instructional swim time. We offer learn-to-swim for beginners and learners, and Swimming and Lifesaving merit badges for those Scouts that complete The Swimmers Test. Here’s what you will swim to qualify for each level. You will do this on Sunday afternoon after you’ve checked into camp (that’s why we have you pack your medical form and swimsuit on top of your duffel). If you don’t qualify on Sunday afternoon we’ll have plenty of opportunities for you to pass the test each day. Learner – Just get into the shallow water and get wet. Beginner – Jump feet first into the water over your head. Level off, swim 25 feet, turn around and swim back. Swimmer – Jump feet first into the water and swim 75 yards in a strong stroke on your stomach or side (breaststroke, sidestroke, crawl, trudgen or any combination). Then swim the last 25 yards on your back, keeping your hands in the water (elementary back stroke). After swimming these 100 yards, float and rest on your back. The Swim Test is fun and not nearly as tough as it sounds. This is the ultimate test if you are a swimmer. Imagine coming home from camp and telling your folks that you swam one continuous mile without stopping. We bet they will be impressed. If you prepare by swimming every day at camp, and you take your time, the Mile Swim is not as difficult as it sounds. The best strokes to swim for long distances are the breaststroke, sidestroke, and elementary backstroke. Pick a buddy in your Troop that swims close to your skill level. The Mile Swim is held on Friday afternoon in camp. Come down to the water at your free swim time. You will receive instruction and get your Mile Swim number marked on your hand. Camp staff will be on hand to guard and assist you. The Mile Swim is open to all Scouts who are swimmers. Many first-year campers Swim the Mile, so give it a try. Scouts are not permitted to bring phones or electronics to camp, but the camp office does have a telephone for messages to Scouts, or to notify them, if there is an emergency. Thursday night is visitors night, and the family is invited to visit camp to see where their Scout has been having fun. The evening is capped off by the impressive Order of the Arrow Call-out ceremony. Parents are invited, and encouraged to visit the Troop at camp, on Thursday afternoon, and to stay for the Order of the Arrow Call-Out. This is always a memorable experience for families, and for Scouts. As Thursday’s supper usually consists of lunch meat, or as we call it at Camp, flat meat, some parents bring food, such as fried chicken, or desserts, cookies, or a watermelon. Prior to the call-out ceremony, the camp director and camp staff members make a presentation about camp to parents. Following the call-out ceremony, parents should return to their vehicles and not the campsite, as it’s easy to get lost on trails after dark. Homesickness can also result in otherwise happy Scouts when family members linger. And the additional ceremony for those Scouts who were called-out cannot begin until after cars are off the roads and camp has quieted down. Arrive after 5 p.m. and bring a lawn chair and flashlight. Feel free to bring a picnic supper; Scouts have a picnic-style dinner on their campsite at 6:30 p.m. The Trading Post is open for purchasing snacks or camp merchandise. Do not bring any pets. Campsites and the lakefront are not accessible to vehicles, and handicapped accessibility is very limited. Be prepared to do some walking. The summer camp emblem is designed to show the number of summers and the different camps you have attended. Take a look at the patch at right. For your first summer in camp you will earn the green centerpiece and a segment for the camp that you attend. After your second summer, you will earn the first of three feathers. The feather segments are added to the patch as shown, indicating second, third and fourth years. Each time that you attend a different camp you will earn that camp’s segment. There is room for five different camps. You should not use two of the same camps segments. After you attend your fifth summer of camp, you will earn the Veteran Camper strip. Those who are lucky enough to be chosen to work on the camp staff will receive the special Camp Staff strip.